One of the best ways to provide optimum care for your pet is to remain diligent when it comes to oral care. 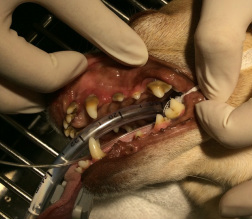 Lack of maintenance care for your pet can cause the same issues it would for humans - including severe tartar build-up, gingivitis, loss of teeth, discomfort, and even severe infections that can spread bacteria systemically. 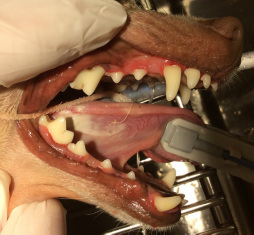 Each pet has the same amount of teeth, regardless of their size, so for many small dogs it's especially difficult to keep those little teeth clean in their tiny mouths, but big dogs still develop dental problems that could have been easily prevented. Provide your pet with dry, hard kibble. This is probably the easiest form of maintenance. Offering your pet hard food enables them to regularly scrape off any built-up tarter on their teeth. It also creates less of a moist environment than a wet food does - this means there's less of a chance of food build-up, too! Give your pet safe, hard chews. Several companies produce safe, digestible products for dogs of any size or age to chew. This is another way to make sure they are regularly scraping their own teeth - as an additional benefit, it keeps your pet busy and chewing on the things you want them to (instead of Mom's expensive high heels). Provide a safe water additive. There are a few different types of enzymatic water additives out there that you can dilute in your pets drinking bowl. As they drink, the additive coats the teeth and breaks down any build-up. Brush your pet's teeth a few times a week. While this may not be an option with some pets, most will allow you to gently brush their teeth regularly with a specially-made, enzymatic (and tasty) toothpaste! Ask one of our staff members for a demonstration!